I remember my parents saying that exact same thing. Your card brings back a lot of memories. 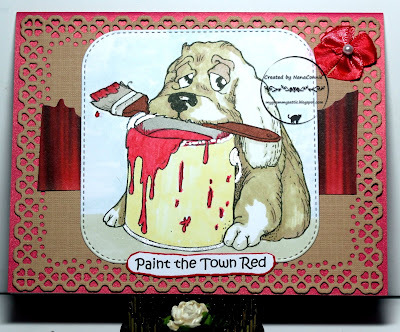 CUTE card too and love all that red. My parents also said the exact same thing too! I love this card and the image is so darn cute! Have a wonderful weekend. Oh this is just super gorgeous. I love that image. Nice work. I love your beautiful blog banner too. That looks fabulous. Thank you for sharing with us over here at "A Perfect Time To Craft" and best of luck with your entry. I love old sayings! Such a nice connection to the past. Thanks for joining us at Cut it Up for our Cats or Dogs challenge! Oh my goodness, that dog looks like he has been drinking instead of painting! Fun card! Fun card. Thank you for entering your wonderful creation at The Crafter's Cafe this fortnight for our "All creatures Great and Small" challenge. I'm here with both my hats on Connie, I LOVE this image and the frame and colour you have used behind it. A Fabulous card. Thank you so much for joining us in our ATG challenge at Morgans Artworld this week. Looking forward to see you again next challenge. The expression on the dog and the sentiment are so much fun. I remember the saying too. Fantastic. So glad you joined us at Morgan's Artworld..